Just about four years ago, we changed professional course. Trexler Climate + Energy Services had started as a one-person shop almost 25 years ago, growing into a 15-person firm well-known among companies, NGOs, and governmental agencies. We worked on the first carbon offsets, the first carbon footprints, took the first companies carbon neutral, built the first carbon pricing model, and more. Four years ago, we had moved on from TC+ES. We had sold the company and I was “on my own” as a freelance lawyer and consultant. Mark was still in the corporate world as director of climate risk at Det Norske Veritas (DNV), a global risk management firm based in Oslo. We were frustrated at the slow pace of action on addressing climate change – but we also had ideas. So, we started our Climatographer’s blog, and later, after Mark had left DNV, the blog became part of our larger Climatographer website. We hung our climate consultancy shingle back up, feeling in the beginning almost as though we had come full circle back to our roots 25 years before. In our first blog post in 2011, we used Pogo, the title and central character of a long-running comic strip written by cartoonist Walt Kelly, to make a point. Perhaps Pogo’s most famous saying, uttered as he looks out over a trashy landscape, was “we have met the enemy and he is us.” That saying helped define the first Earth Day some 45 years ago. There are many rational explanations for why we are not acting fast enough to address climate change. 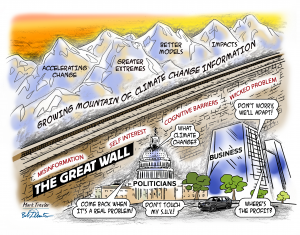 The bottom line is that we as communicators haven’t figured out how to make climate change sufficiently relevant to individual and societal decision-making to cause a substantial and rapid deviation from our status quo energy and economic path. Can we get to a low-carbon global economy? Yes, we can. But technology transformations take time. Today, it looks most likely that the key transition to a low-carbon economy will come only after we’ve committed the planet to substantial, perhaps even catastrophic for billions of people, climate change. I periodically come around to the idea of giving up. Scientists have recognized the risks of climate change for decades, and I’ve been working in the climate arena for almost three of those decades. To not see a solution in sight is, shall we say, depressing. In the end, though, I always seem to come back the idea that you can’t just give up without a fight. We intended our new endeavor as The Climatographers to differ from our previous more traditional corporate risk and risk management consulting. Rather, we intended to focus on exploring whether and how climate change could be made more relevant to individual and societal decision-making. We felt that something was missing, that “climate risk communication” simply didn’t seem to be happening. Over the 45-years since Pogo’s statement, we’ve seen a lot of environmental progress. In the U.S., we’ve enacted and refined a number of environmental protection laws at both federal and state levels, many of which are emulated in other countries. Air and water supplies that in the mid-1970s seemed toxic are now breathable and drinkable. Hazardous waste sites have proven to be possible to clean up, at least in part. We have laws protecting forests and threatened wildlife. Many of these laws and the case law and regulations surrounding them were controversial in the mid-1970s and early 1980s. Some still are. But many of the battles seem to have moved on. Importantly, over the past few years something has changed when it comes to risk communication. “Climate risk communication” has become a buzzword in just a few short years. Reports on climate change with titles like Risky Business appear regularly. 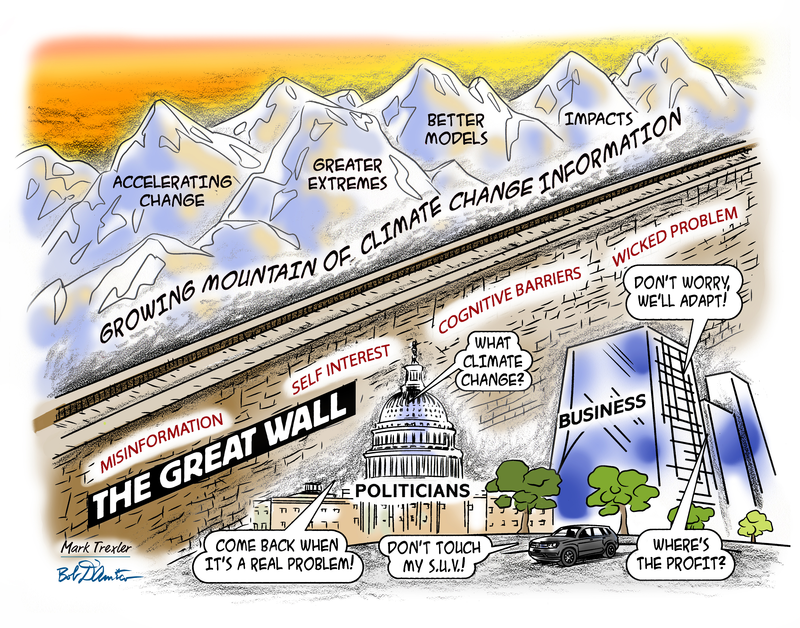 Many professionals in science, policy, and news disciplines now recognize that the “enemy is us” aspect of climate change is greatest in the area of risk perception and risk communication. Dozens of reports and books with titles like George Marshall’s 2014 Don’t Even Think About It: Why Our Brains are Wired to Ignore Climate Change explore these communication challenges and the role of psychology and human behavior in impeding action against climate change. Unfortunately, simply presenting climate science and climate risk via a 20-minute PowerPoint presentation, an insightful news story supported by reputable professionals, or just sitting down with someone and explaining climate science and risk doesn’t work with difficult topics such as climate change. As Patterson et al. note in their seminal book Influencer: The Power to Change Anything, each individual decision-makers needs to be able to affirmatively answer two key questions: 1) is the problem “worth it” to me as an individual; and 2) can I influence the problem if I choose to? Both questions are harder than you might think to answer when you start doing the calculus of just how many potential decision-makers are out there, and recognizing that each one is different and needs different information to answer the two questions. Individual, business, and public decision-makers have a huge amount of information available to them when it comes to climate science, mitigation, and adaptation. But notwithstanding almost infinite amounts of information, a key challenge is getting the right information to the right decision maker at the right time. That’s why we’ve been working on the Climate Web for the past several years. First called the Climate Brain, then Climate Watson, and now the Climate Web, our goal has been to use innovative TheBrain™ software to build an easily accessible knowledge solution that helps counter the popular adage “we’re drowning in information and starved for knowledge.” The Climate Web is a crowd-sourced knowledge solution based on thousands of publications, reports, news stories, and websites. Providing access to more than 10,000 documents and more than 12,000 URLs, with 55,000 “thoughts” and almost 100,000 “links,” all individually created and curated to help access “actionable knowledge,” the Climate Web starts with the hypothesis that infinite information is not enough: decision-makers need access to actionable knowledge, and software-based knowledge solutions can provide a big step forward. What’s different about the Climate Web is that we’re not suggesting we have the answer to climate change. Instead, we are working to pull together the best thinking and ideas from the thousands of individuals and organizations who are doing good work in this field, many of whom you will never normally come across. After more than 25 years of efforts to address climate change, doesn’t it make sense to add such knowledge solutions to our climate change toolbox? We’ve made massive progress with the Climate Web over the last four years, continually reorganizing it to make it more accessible to users. We’ve recently made it public; visit it at www.theclimateweb.org. We’re the first to admit it’s not the simplest software solution out there. But should you expect it to be simple, given that climate change is the most complex problem anyone has ever tackled? We’re still here, and we will be here, continuing to work on ways to communicate climate change and climate risk in ways that we hope can make a difference. We’ve really only scratched the surface of what’s possible with the Climate Web, and we invite you to help us live up to its potential. Can the Climate Web significantly reduce dangerous climate change? Maybe, or maybe not. But there is too much at stake not to try. The link to climateweb appears to be broken. Thor, thanks for letting us know. The error has been fixed. You can always get there directly, too: http://www.theclimateweb.com.